BRASS BELL Come aboard and enjoy true hospitality. 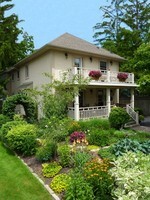 JOHN'S GATE GOURMET BED AND BREAKFAST Service! Gourmet Breakfasts! Specials! EAGLES WING A happy and tingling moment captured in the whisp of a fresh orchard blossom! CAPE HOUSE B&B Welcome to our home!